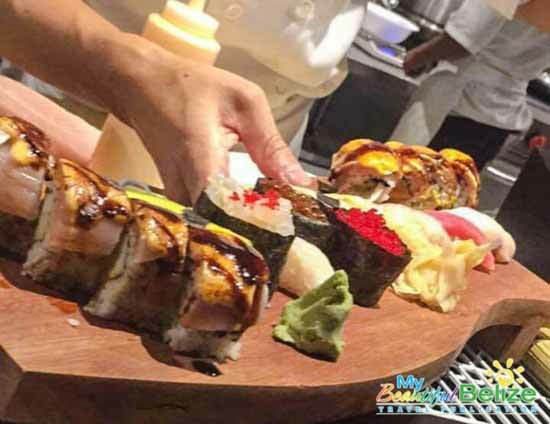 Located at Mahogany Bay Village, just south of San Pedro Town, Jyoto Japanese Restaurant and Sushi Bar is causing quite a stir among sushi lovers. With authentic flavors from his homeland, made with only the freshest sourced Belizean produce, Toshiya has set the bar high. We promptly ordered a couple bottles of Sake, after all we were prepared to do the Japan experience right! Before us was Toshiya, artfully preparing rolls of sushi and plating sashimi. The dinner menu offers a well-rounded list of Japanese cuisine option, and we decided to start off with the Jyoto Gyoza (pork dumplings). One word: DELICIOUS! Probably the best dumplings I have had in my short life. Of course if you know what you want, you can always order an entire roll off the menu. I highly recommend the Spicy Tuna Roll – the spicy mango on top is killer! I’ve been waiting for one particular restaurant to open for a while. Announced at the end of 2016, Jyoto Japanese Restaurant & Sushi Bar is finally OPEN! Located at Mahogany Bay Village – about 2 miles south of town, the restaurant opened quietly last month. But it was this advertisement on their facebook page that was my call to action. The entire menu is available and it’s quite impressive. I loved the selection of teas – I tried the smoky green tea ($3bzd) and loved it. The appetizers all sound absolutely delicious. Garlic-soy edamame, gyoza (or Japanese pork dumplings), poke salad, seaweed salad…yum. Let me stop for one second to say how great our server was. She was knowledgeable about the entire menu – answering all of my questions about the fish and the difference between the green teas. Really really on top of it all. 2 registered members (Marty, 1 invisible), 174 guests, and 9 spiders.